This recipe is an adaptation from Shreen Appa’s cook book…. :) I am sure you will love this recipe. 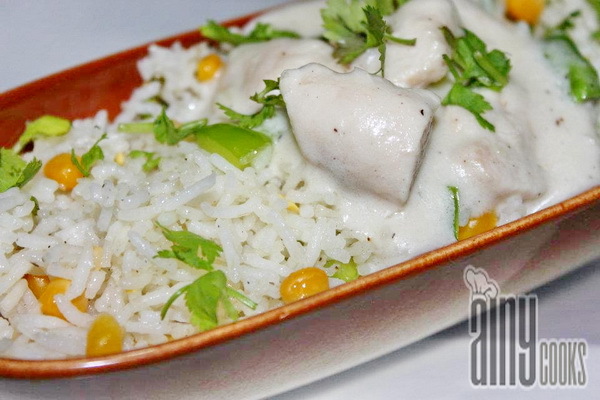 Aroma of corn rice combined with creamy sauce chicken will give you a unique taste. In a deep pan add butter and oil then add rice, toss them and add all other ingredients one by one. Toss them and in a tube pan fill then tightly.But served them without giving ring shape. 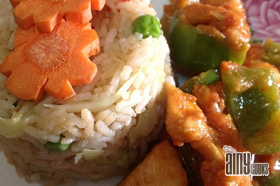 But Do try this ring shape rice…:) Now cover with foil and bake these rice at 180c for 10 mins. In a pan add butter and garlic chopped.Saute and add chicken cubes, fry till color change. Add onion ,salt ,black pepper and flour again saute for 5-10 minutes then add chicken stock on low flame. Stir it constantly to make a smooth sauce then add mushrooms ,coriander leaves, green chillies and green onion. Now add cream in it. Stir it and remove from stove. In a platter invert the tube pan and carefully remove it.